This post is going to be a méli-mélo, a mish-mash, a little bit of everything. 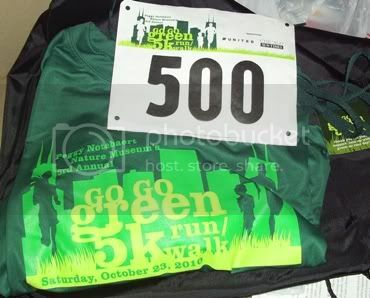 1 - Today I am walking a 5k for the Peggy Notebaert Nature Museum! I am really excited. My number is 500 - which is oddly round and even. I hope it's lucky! The Race for the Cure walk was with a friend, so we talked a lot during it and walked casually - also, it was almost 20 pounds ago! So hopefully at this race my time will improve a little. 2 - Thank you everyone for your comments this week on a bunch of different entries, especially the one about letting friends/family read your blogs. Luckily my mom is the kind of lady who asks once, then lets it go, so it's not a major pressing problem, but the main thing I need to focus on is taking care of myself. I am such a firstborn in the sense that I always want to be taking care of others, making sure everyone is getting what they need without first considering if I can say the same for myself. 3 - Great NSV this week - I can feel that my arms, wrists, and hands are thinning out, so I decided to try on a bracelet that one of my old students made me. Her family is from India and they make jewelry for special occasions, so she made me a necklace and bracelet before my Masters exams. I wore the necklace to graduation but the bracelet was just a little too small. Now, it's a little too BIG! Awesome. 4 - And speaking of students, I had the best day teaching yesterday. I gave my problem students a talk and said that I understood it was a busy time of the semester and that I understood because I too was once a student, but I cannot push exams back, so we need to be staying on top of things - so, in class, let's relax a little and do some fun activities and then this weekend, you'll rest, eat your Wheaties, and come back Tuesday ready to give week 10 your all. This week we're reviewing two past tenses (one for descriptions and repeated, habitual actions; the other for precise moments or limited times), so I made a ton of overheads with quotes from French translations of books they knew - like "Charlie and the Chocolate Factory" and the first Harry Potter book. Then I made them a great worksheet with fairy tales and had them work on them with partners. They reacted amazingly well, which was great - and in my afternoon class, a kid stayed after to tell me it was the best day in class of any of his classes all year. Totally awesome teacher moment! I agree the best way to get rid of stress is exercise. This week at work was hell for me and on Tuesday afternoon it was a bad day at work and I found out my boyfriend's sisters dog (mouthful!) has cancer and less than a month to live. I've known the dog for 4 years and we're her second home. We watch her all the time, and she's my 2nd favourite dog (can't favour her on top of my long time family pet!)... all I wanted to do was run, and I got such a good workout in after work!! Hope your 5k goes wonderfully! I will be thinking about you!